This set includes a frying pan, pot with lid, saucepan, spatula and a mixing spoon. Made from metal and rubber wood. 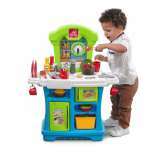 These durable pieces are great for pretend cooking play. Cook up a mighty fine feast-just for fun! A 12-piece stainless steel set comes with pasta pot with lid, stock pot with lid, frying pan, slotted spoon, spatula, ladle, pasta ladle and spoon, and 2 pot holders.